I guess since I’ve done a couple of entries about movie going in China already, I might as well turn my movie-going journeys outside of Hong Kong and the United States into a series (my next stop is Japan, by the way). Opened in 2005, the 7-screen multiplex took on a major expansion in 2009, adding five additional screens with digital projection (there’s also a premium auditorium for 230 yuan a ticket). I didn’t just pick this cinema because of its vicinity to KKMall (same subway station, different sides), but also because this 12-screen multiplex is consistently one of the top ten highest-grossing cinemas in China. And let me remind you, China is a BIG place. I watched two films here today, both on screens at the expansion side: the real-life mountain biking adventure KORA and the mega-hit romantic comedy LOVE IS NOT BLIND. While the cinema boasts state-of-the-art projection and top-level comfort (for 65 and 75 yuan tickets, they better be right), I actually found OSGH a bit of a disappointment. My biggest problem was the seating, which is not only less comfortable than those of most Hong Kong multiplexes, my bottom began to hurt about an hour into both films, which is inexcusable for auditoriums that were built in 2009. Also, while KORA’s digital print looked fine, the digital print for LOVE IS NOT BLIND - playing in the biggest house with the supposed Sony 4k projector - was a bit too dark for comfort. I can’t say anything about sound, since neither film is exactly an audio powerhouse. 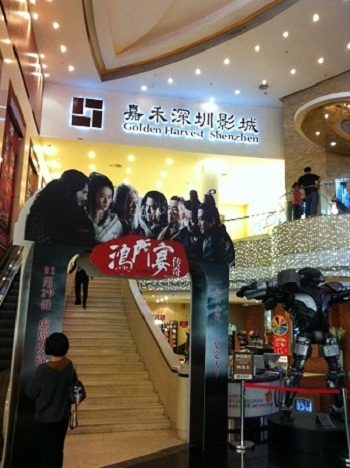 However, OSGH Shenzhen does beat KKMall in terms of location. Not only is MixC connected directly to the Grand Theater Station via an underground tunnel, MixC has both a Starbucks AND a Pacific Coffee, especially important when tickets have to be picked up an hour ahead of time at the latest. MixC is also a lot bigger (it houses a small skating rink) with more food choices. Despite being an early Sunday afternoon, the Pacific Coffee one floor above the cinema (at the Northwest corner) is practically empty and has free wi-fi without any China Telecom hassle (more on why this is important in a bit). Nevertheless, it’s the quality of the cinema that counts, and that may be why I won’t be returning to Golden Harvest unless I have to. Groupon deals: Cinemas have been selling groupon deals, and bargain-hunting Chinese audiences have been eating it up in bulk. Since such deals cannot be redeemed via online ticketing, they’re causing large lines at cinema box offices. Golden Harvest has been wise enough to set separate box office counters for groupon deals, but UA KK Mall was not as wise. If you’re not planning to order your ticket ahead of time, get to the box office early. Picking up your ticket: If you do book your seats online ahead of time like I do (look at part 2 for more details), know that the cinemas are serious about canceling your booking 60 minutes before the film starts. I arrived at UA KK Mall at 10 am to pick up my 10:30 TIN TIN tickets (the mall doesn’t open til 10 am), and after spending 15 minutes in line (thanks to the groupon people), my seat was canceled and sold already. Luckily, I was able to pick another seat because the showing wasn’t full. Wi-fi: If you do have to arrive at the cinema to pick up your ticket, you’re going to have at least an hour to spare. I like to go get a cup of coffee (it’s a long trip up to Shenzhen), which means I usually go to Starbucks. Back in July, I was able to access the free wi-fi in the store and get to Twitter and Facebook via the VPN connection I had already set up on my phone. However, China Telecom now require users to register their cell phone numbers before using the wi-fi, so my Hong Kong number didn’t work. However, Pacific Coffee’s free wi-fi simply requires you to put in a password that is displayed prominently on the store counter, which means I had no problem getting wi-fi at Pacific Coffee. So if the place you’re going to only has a Starbucks, bring a good book. Audiences: Watching KORA in China felt like I was in someone’s living room watching TV. Everyone has something to say about the film, and there’s no way you can shut everyone up. Talking, texting, phone calling at the movies in China is a commonplace, and while it shouldn’t happen, you will have to accept it as part of the movie-going experience in China. Of course, I can’t do it since I went to the movies alone, but as the old saying goes: If you can’t beat ‘em, join ‘em. English subtitles: Last time I was in China, neither REST OF YOUR SHOULDER nor WU XIA had English subtitles. This time, both KORA and LOVE IS NOT BLIND had English subtitles (though LOVE’s English subtitles were so bad that it’s not worth the visa to go to China to catch it if you’re relying on it). There’s no set rules, so you’ll have to rely on luck on this issue. There are plenty of big blockbusters opening in December and Lunar New Year in China, so I hope this guide will be of use to those planning to visit a Mainland Chinese cinema during the holidays. Next time, I hope to go to the cinema in the Shenzhen Music Hall, and that’ll likely happen in December.